So mother nature is up to her old tricks again. It’s been in the 50’s for much of the day and we had light rain and drizzle fall through mid-afternoon and now it is just cloudy and temps have bumped up to around 64 at our house. The good news is that yesterday was a beautiful day and tomorrow is suppose to be beautiful as well. So one day of not so great weather is much easier to take than several in a row. Plus, given all the places that are having real weather problems, a cloudy, cool and rainy day is hardly something to complain about. My heart goes out to those that have had to deal with flooding, or heat or fire. We did have a pretty good week of weather up this way. I was busy with a bathroom remodel, so I did not get to partake in it as much as I might otherwise have, but I am almost done with the work and I did get to spend some nice quality time with the girls and pups outside. Plus, this remodel is something that has been in the hopper to do for quite some time. It is the master bath, which when we built the addition, was kind of just put together to get us through until we had time and money to make it right. The addition was done just 4 summers ago, so I guess it has not been a real long time coming, but long enough. It will be nice to take a shower and not look at the faux tile and half baked job of trim. I have just the new trim work to do, so pictures will likely appear next week. I’m trying to think of anything exciting that happened up this way this week and am currently drawing a blank. That does not mean that nothing happened, just that my memory is going! I do have 10 pictures to share, but they are all from the same event. So I was trying to think of some other material and got nothing, so I guess I will talk about that event. 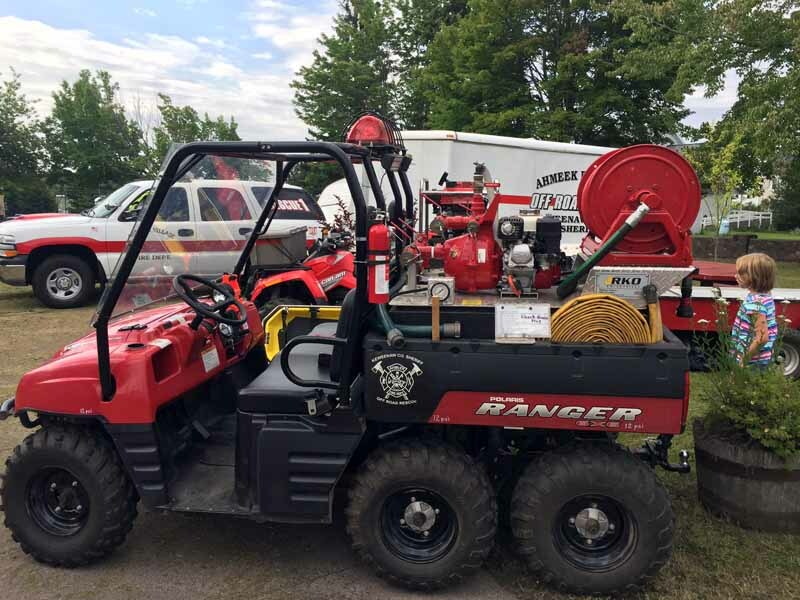 On Saturday, different branches of the Keweenaw public servants all gathered at the park in Mohawk and brought along some of the equipment that they use. There were the usual fire trucks and an ambulance, but also a county snowplow and grader that is used to clear snow in the winter. 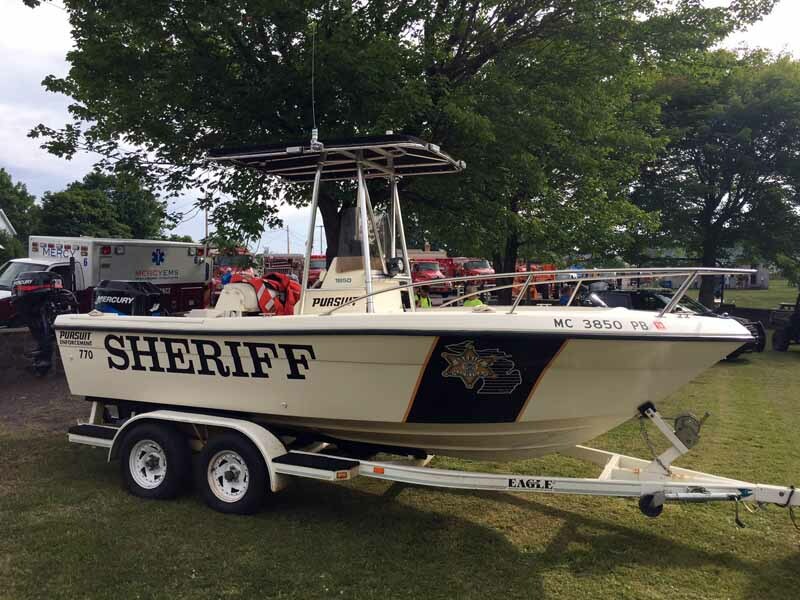 Our first stop was to check out the Sheriff’s nice fishing boat. It’s a really nice boat and all decked out with the latest. The only thing I wondered is why when he is out relaxing on his day off would he want to be in a boat that told everyone who he was? Maybe so he won’t be bothered. But seriously, living were we live, the police, fire and rescue all need some pretty specialized equipment to perform their duties. 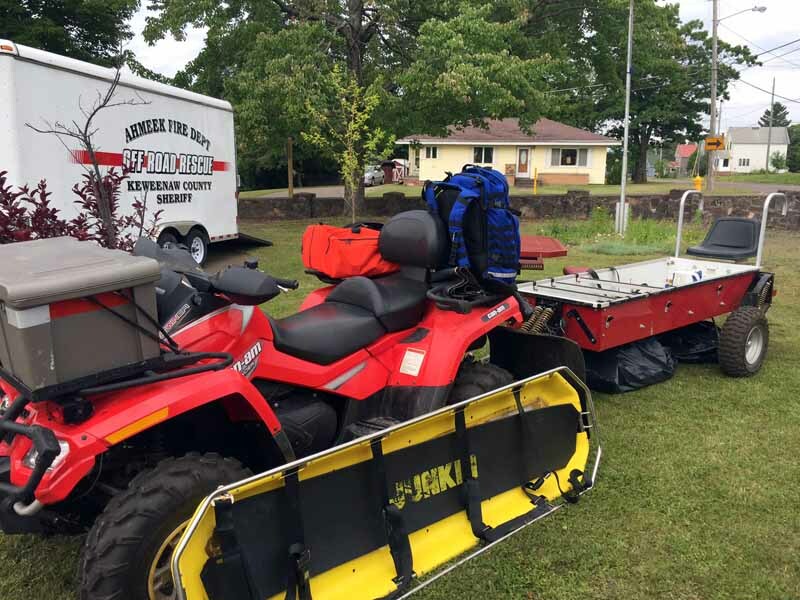 Another specialized piece of equipment was an ATV equipped with a rescue sled. 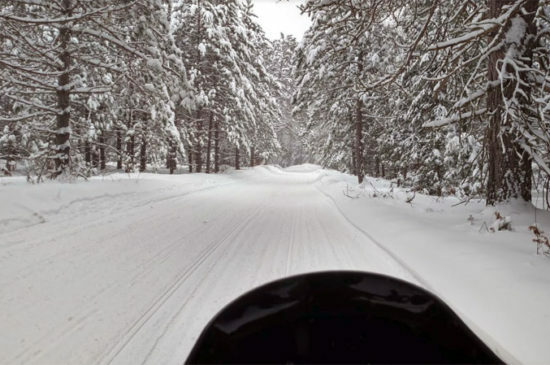 In the winter, the sled is pulled by snowmobile and there seems to be a handful of folks each season that unfortunately have to take a ride on that sled. Something I did not even know we had, but is really cool, is a side by side equipped as a fire fighting vehicle. Nora was asking me if we could set our’s up like that so she could water her garden. OK, I promise, enough of the corny jokes. I must be getting slap happy or something. 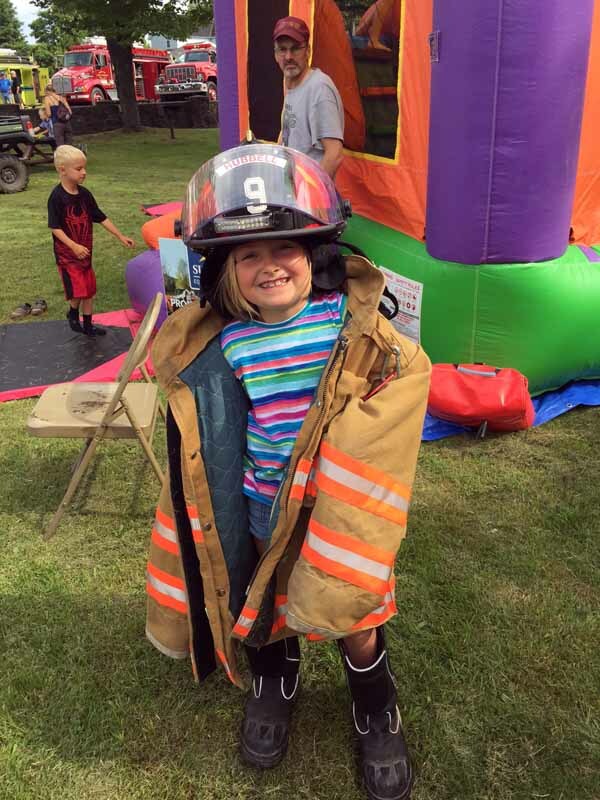 The event was set up more for the kids, so that they could get to see all the equipment up close and become more familiar with it and the folks that operate them, so that they are not as afraid if they need rescue or help from our Police, Fire and Rescue. I thought it was a great idea, as there were tons of families that showed up and the kids all loved to check the equipment out. 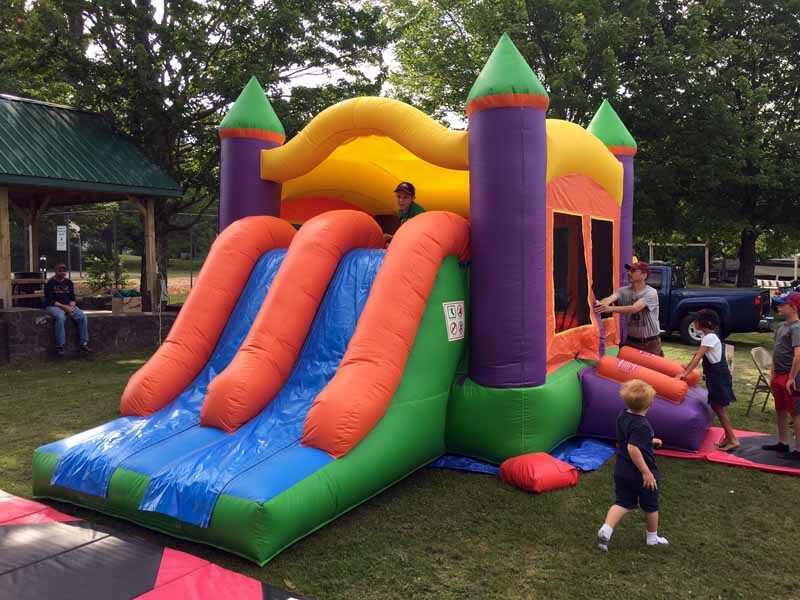 Of course, if you are going to have kids at an event, you need more than just fire trucks and other fancy vehicles to keep them interested, so they also had a bouncy house. That was a big hit and so was the face painting. After the face painting, you could put on the fire fighting gear of the volunteer fire fighter that was doing the face painting! Looks like Grace needs to get a bit taller before she can sign up. Oops, I did it again. Sorry! 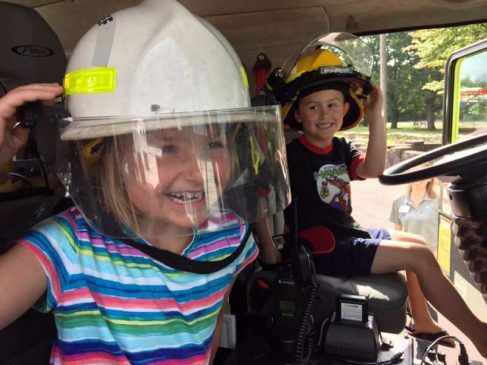 Everyone, including the kids, were allowed to climb up into the vehicles and check them out, so Gracie and her buddy hopped up into the cab of one of the fire trucks and were even allowed to put on the head gear. As I watched the kids climbing up into the truck, I though to myself…”how cool!” Here I am over 50 years old and I have never been in a fire truck. I have spent more than my fair share in the business end of an ambulance, but that just not the same. We did not even get to use the lights and sirens! 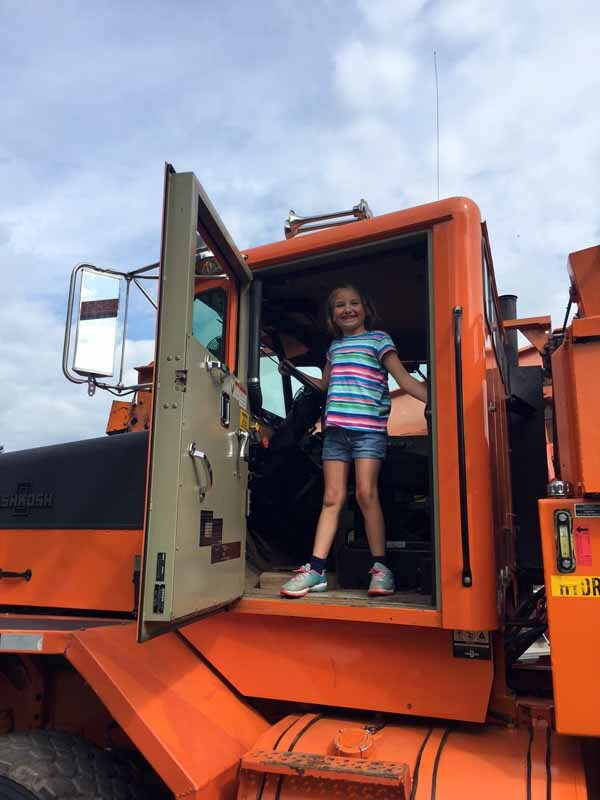 Along with the fire trucks, Gracie also hopped up into the cab of one of the county snow plows. It is amazing how huge those trucks are. 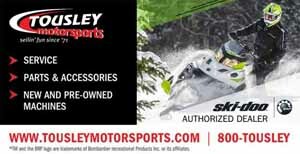 By the time you are sitting in the drivers seat, your head is about 10 feet off the ground. I must admit, I could not resist and also hopped up into the cab of that one. Hey, a guy can dream right? Actually, I really wanted to see the perspective that the drivers had. Amazingly, although they are so high up, their view is not too great. So keep that in mind next time you are driving in the vicinity of one of them. You may or may not be seen and in the case of an accident, you lose! 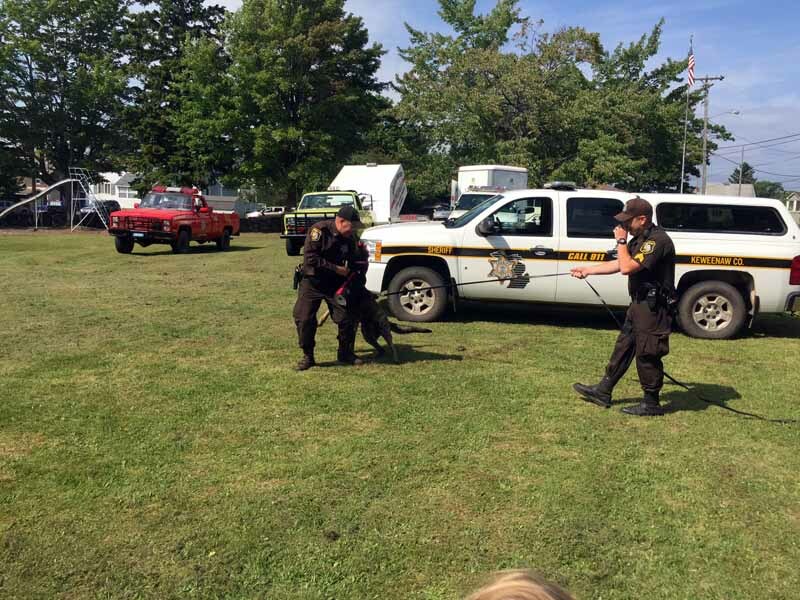 This spring, the Keweenaw County Sheriff’s department added a K-9 to their staff. As luck would have it, he was put to use only a few weeks after joining the department. Some hikers lost their way in the woods up here and the dog found them very quickly, sparing them a cold night in the woods or worse. Search and rescue is not the only thing that this dog is trained to do. He also has some rather aggressive ways to get you to obey what his human partner is asking you to do. That is the first time I have ever seen that done live and trust me, you do not want to be on the receiving end of that dogs mouth! A very powerful animal for sure. 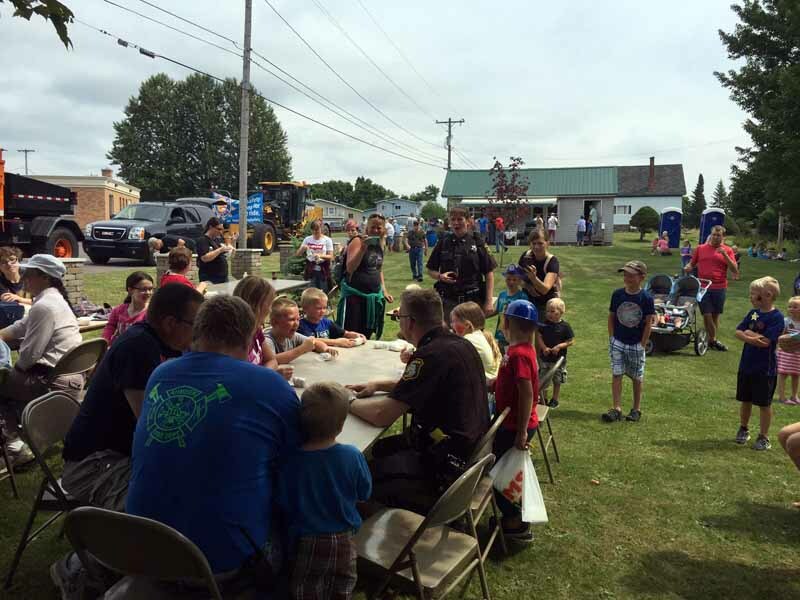 As a way to kind of poke fun at themselves, the Sheriff’s department also invited visitors to join them in a doughnut eating contest. There were not a ton of participants, but the contest was not won by a police officer, it was won by a fire fighter! So there you go. My favorite fire fighter has a history of blessing me with a kringle from a place that is know for them in the Racine/Kenosha area on some of his visits, so perhaps it was more than coincidence that the fire fighter won the doughnut eating contest! I guess that about covers it for this one. Thanks for putting up with my awful jokes, but something just would not let me keep them in. Looks to be another bell-ringer of a week of weather up here. We still have not had to use the AC and it looks like this week might pass by without having to use it. It does get nice and warm during the day, but then cools down into the 50’s beautifully at night. So if you are longing to sleep with the window open, come on up!